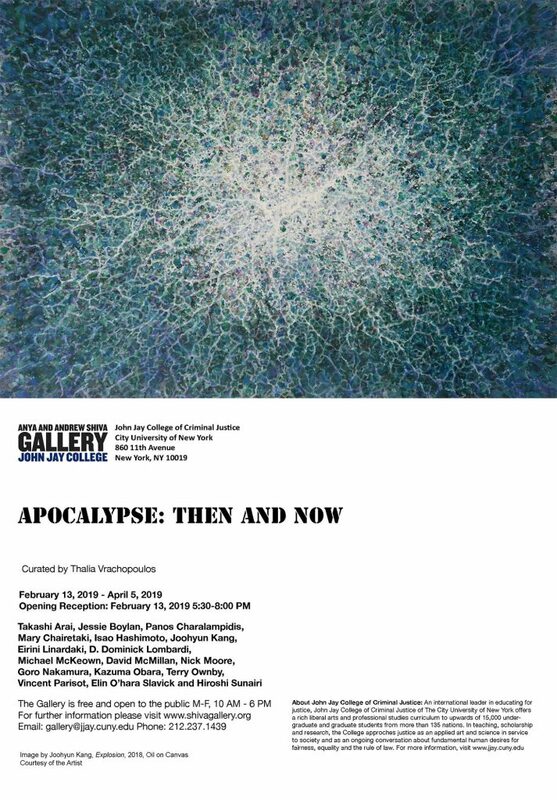 The exhibition “Apocalypse: Then and Now” reflects sinister omens for the future as seen in our daily life and reported news. In a world overwhelmed with wars, instability, and violence, the earth is exceedingly threatened by nuclear catastrophe. In response to these circumstances, the participating artists confront and examine the issue of nuclear extinction. At a time when nuclear threat is sharply increasing from North Korea, China, Russia, and the Middle East, the possibility of a holocaust has threatened widespread destruction and the eventual collapse of civilization. In this scenario, large portions of the earth would become uninhabitable due to radioactivity and fallout, the destruction of cities and their infrastructures, lack of sanitation, nuclear firestorms, widespread radiation sickness, the loss of electricity, and the failure of communications. In general, a nuclear winter would ensue. This radioactive winter has been predicted by scientists such as Alan Robock, who stated that it would be lasting and actually bring the modern world to an end. Extinction would follow as a result of societal fragmentation, environmental consequences, and, in general, economic and social collapse. Korea. Today it is China, and there’s always the possibility of a nuclear explosion arising from conflict in the Middle East. Living conditions for large portions of world populations have become untenable, and for the whole world, a nuclear winter is a probability–unless we embrace accountability. Artists Terry Ownby, Goro Nakamura, and Jessie Boylan have photographed past disasters, such as the one that occurred in Chernobyl, Ukraine, 1996; and in Fukushima, 2011; Tokaimura, 1997; and Three Mile Island, 1979. Elin O’Hara-Slavick, David McMillan, Takashi Arai, Isao Hashimoto, Vincent Parisot, and Hiroshi Sunari are interested in showing the results of nuclear fallout at such test sites as Los Alamos, Hanford, Rocky Flats, Techa River, Semipalatinsk, Kazakhstan, and Lake Karachay. Panos Charalambides and Mary Chairetaki use references from various civil defense publications that are relics of the cold war era. Thus, they add to their art an authoritative power, brought about by their use of a bizarrely detached and unfeeling approach toward the life-threatening event of an imminent nuclear war. Kazuma Obara, Nick Moore, Dominick Lombardi, Michael McKeown, and Eirini Linardaki allude to nuclear catastrophe through more general art frameworks rather than to depict specific events. About John Jay College of Criminal Justice: An international leader in educating for justice, John Jay College of Criminal Justice of The City University of New York offers a rich liberal arts and professional studies curriculum to upwards of 15,000 undergraduate and graduate students from more than 135 nations. In teaching, scholarship and research, the College approaches justice as an applied art and science in service to society and as an ongoing conversation about fundamental human desires for fairness, equality and the rule of law.